It is not possible to create a custom form in the default Magento; up to this time the best you could do was to alter the registration form. This Custom Forms extension fills up the gap while keeping your Magento in compliance with GDPR requirements. This module is designed to help you adjust Magento to your specific needs. Optimize your Magento 1 form and vary the fields so that the customer won’t get tired or annoyed filling them in. For example, apply psychological trick: ask questions and provide a choice of answers. If you put it in a visually small form, users will fill it in on the run with just a click. Keep in mind that most of your clients are likely ready to share some of their personal info, like hobbies or profession, if it won’t take much time. Optimum selection of fields serves this exact purpose. Sometimes creating a custom form for Magento can seem a bit tricky. Now you don’t have to worry if you forgot to include a field or don’t need a certain field anymore. This form builder for Magento 1 allows editing a form. You can add, remove or edit fields in no time. You can also mark the field as required for collecting e-mail addresses, for example. Also, now it’s easier to assign IDs for forms’ lines and configure their CSS style the way you wish. Use every opportunity when your clients feel like leaving some feedback, share personal info or take part in a survey. Place several web forms on one of your webstore pages, or even create a separate page for webforms. Allow clients to conveniently communicate with you in full. On top of that, this Magento form builder extension includes two integrated Captcha functionalities to protect your webshop against spammers and abuse. 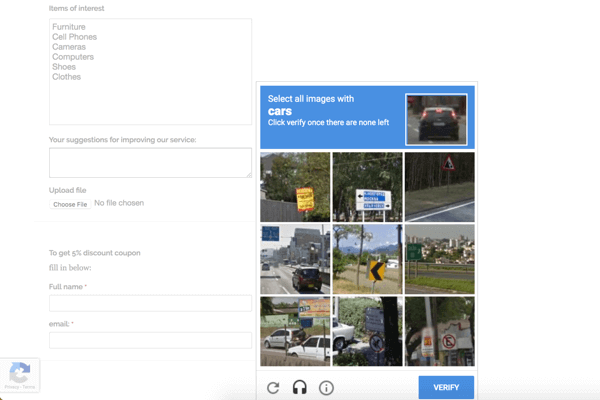 Choose between Google Invisible reCaptcha and Zend ReCaptcha that will assure that you get only real data. When a client submits a Magento form, the extension directs him to a certain page on your webstore. You can set the destination page manually, depending on what the form was about. For example, if a survey is on mostly desired stock for next shopping season, lead customer to the newest collection of the present time after form submission. Thus you obtain two goals at a time: you collect feedback and increase conversion rate. When creating custom forms in your Magento, aim to learn more information about your customers. This module accumulates all the submitted forms in the admin panel. You can refer to this data at any time, analyze it and improve your marketing strategy and customer segmentation. To analyze and work with data in the environment you prefer, you can export submitted data in bulk via CSV file. Setting up Magento web forms with this extension is quick and easy. Try a DEMO and see for yourself. The extension offers a handy feature that will help you to collect customers' consent on the usage of their data. Enable a checkbox for opt-in consent with a description of how are you going to use your shoppers' data. The Magento Custom Form extension comes with the built-in Google Invisible reCaptcha module that protects your custom forms from spam and frauds. Benefit from the most advanced security tool and boost your store security. This is a great product and the support for customizing it is just outstanding. I am very impressed and happy with these forms. I can't say enough about the support we receive with every extension we purchase from Amasty! The extensions install easily and when support is needed they respond fast. We needed a form that would stop all the spam from getting our system overloaded. Looked at many different extensions and chose Amasty. We have several Amsty extensions and as the rest they work great. Customer service is excellent answering all questions and taking care of small issues. A+ for this developer. You do have to pay quite a lot for this Mod however it is a nice simple solution for an annoying issue of magento. We had issues receiving the email notifications when the forms are filled out however Amasty fixed that very quickly for us. Bit disappointed that it didn't tell us the content of the form via the notification email HOWEVER Amasty have informed us that this will be added soon, which is excellent. Worthy extension, really helpful for handling forms with exactly the fields you need. Captcha is good for antispam, but our clients complained that it’s irritating. We ended up rethinking the forms and use captcha only with forms with important information for business. 1. Easy to create forms (once you figure how to do it. At first it’s tricky though). 3. Emails with submitted forms are sent to admins; moreover, module keeps statists. We’ve just included forms into the site but later on it would be useful to review the stats and see what types of fields the clients are willing to fulfill. 4. CMS integration of forms is really easy, and it’s possible to preselect to which page customers should be redirected after submitting forms. 4. Please provide email or phone number form validation for registered customers. Overall the ext is a bit pricey but does the job! – Added new type of field "Single File Upload"